When homeowners find cracks in their home, they often panic—and we certainly understand why. The truth of the matter is, a crack can be anything from completely harmless to a simple repair to indicative of a serious and costly problem. 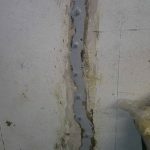 This is why it’s so important to have cracks inspected and to have a professional determine the best course of action. 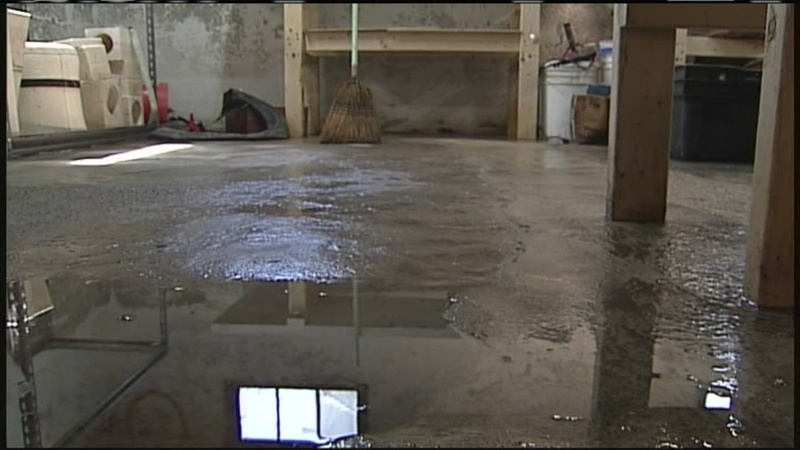 Of course, you might be wondering whether it’s structural repair or waterproofing that you need. The truth is, the two go hand-in-hand. 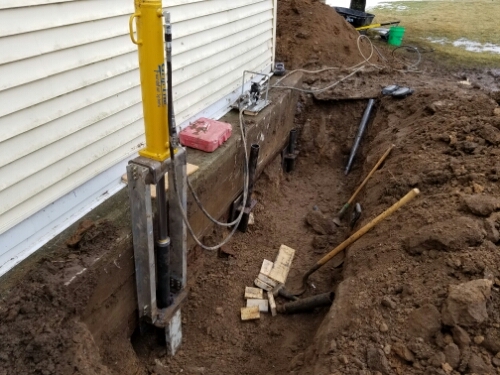 When you have a foundation problem, it automatically puts you at risk for a water problem, too. While not all cracks will be actively leaking, if you’ve found one or more of them, you might be worrying about moisture seeping into your basement in the future. Whether you have a current water problem, or you’re just being proactive, you want to explore your options. If the cracks you’ve spotted are not indicative of a larger problem that also needs to be addressed, then a simple crack repair may be all that’s needed. At Adams, we use polyurethane crack injections to seal cracks. This rubbery material comes in fluid resin form, which, when injected into cracks, will undergo a chemical transformation from a liquid to a solid. As this occurs, it is expanding exponentially and fully filling every crevice of the crack for complete waterproofing. If there is a structural crack that is leaking, we can also lay carbon fiber over the injection. But it is important to inject the polyurethane prior to carbon fiber in case we can’t go back and waterproof later. 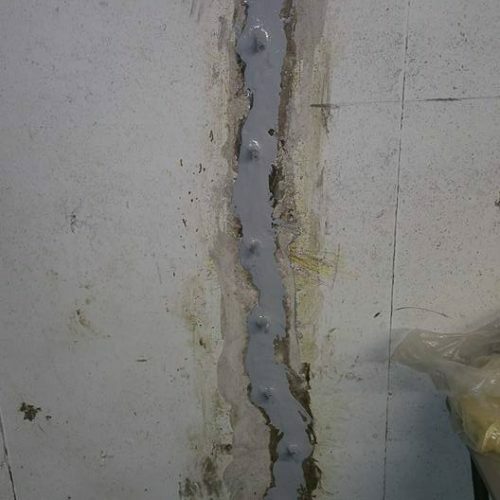 While this is the best method of treatment, unfortunately, many companies are still utilizing epoxy for crack repair—a material that has been known to leak. At Adams, we have a zero-failure rate when we waterproof by injecting polyurethane. Beyond crack repair, should you also have pooling water on your basement floor, then you may require taking your waterproofing efforts even further to install an interior tile drain system in addition to your sump pit and sump pump. 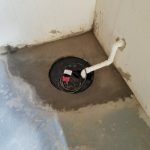 We often hear homeowners say that they didn’t know whether to call a “waterproofing company” or a “foundation repair company.” While a lot of companies, like Adams, offer both services (as we mentioned, they go hand-in-hand), it’s important to understand that not all companies are created equal—even if they say they handle waterproofing and foundation repair. The fact is, quite a few companies out there only handle small crack repair. That means that even if your foundation crack is actually indicative of a much larger problem—that requires a larger solution (such as wall anchors or piering)—the company will still just fix the crack. But that’s a lot like putting a band-aid on a gaping wound. While it’s quite true that your crack may only require a simple crack repair, you still want to be careful that you choose a company that would be able to recognize and solve a larger problem. A company of this caliber should also be able to offer you a warranty on their repair work that will cover you down the road. Of course, there are a lot of smaller companies that use their warranties to “hide behind.” Though they know you have a larger problem at hand, their warranty will only cover you for the immediate crack repair that they’ve performed. Don’t get stuck with larger problems when you can make sure everything is addressed—and covered—from the get-go. At the end of the day, you want to be able to feel confident that your home is in good hands. By choosing a company that you can trust, you’ll gain that valuable peace of mind.